Today was our last riding day. We took the McKenzie Highway from Sisters back to Rainbow – 2000 feet up, 4000 feet down. The morning way fairly nice. We stopped at a grocery store in Sisters for breakfast and lunch supplies. Ruth and I hung out outside with the bikes while Anne got the goods. Then on to McKenzie Highway. The climb started right away, but very gently. It was a big broad forest, although with lots of stumps. Chipmunks scurried about, threatening to jump under our wheels. We had the music going for Ruth, and she would occasionally sing along. The grade slowly ramped up over about 10 miles, peaking at about 6%. Then it got a bit more erratic. The scenery changed, too. To the north was a lava flow, mostly without anything growing in it. It looked like a big pile of rubble. It’s kind of hard to believe that it’s a natural formation. The lava flow kept flitting about on the right, until we got near the top. Then, the road was cut straight through the flow. It felt kind of like being on an alien world. Finally it opened up a bit, and there was the Dee Wright Observatory. This is a structure built at the McKenzie Pass summit out of rocks from the lava flow. It’s kind of a tower, with stairs (made of the lava rocks) and railings (made of the lava rocks and chains), with a room inside that has holes in the walls to view each of the 8 or so mountain tops visible. The whole thing felt like something that belonged in Mordor. We ate lunch in the observatory, since it was the only shade wert had seen for a while. As we were leaving, we saw a supported tour group setting up, complete with a canopy and takes and chairs. I’m glad we did the ride self supported, but it sure would be nice to have other people carry all the water, food, and luggage, and have a hot lunch waiting for us after each climb. We saw a number of folks from this group climbing later, including one that was getting SAGged to the top. Then, the descent. It started off pretty moderate and straight, but then got steeper and curvy, including several switchbacks. This was by far the most windy road on this trip, but we trained on much worse back home. Near the end it started to level off, but stayed generally downward to our hotel where we had left the car. The innkeeper came out as we pulled in to saw she was glad we made it back safely. It’s nice to be back, but I’m sad that we’re done with the tour. I know that Anne had fun, because she’s already planning the next one. Overall, I think we prepared enough for this trip. None of the climbs exhausted us, although we were ready to get off the road by the end of most days. Anne pulled the trailer the whole way every day, which really impressed me. We had enough food and water every day. We never really got lost. Ruth was pleasant most of the time, and napped well in the trailer. The only things we brought but didn’t use were rain gear and most of the first aid kit. Those seem like good things not to need. Now I just need to remember to stay out of the shoulder for the drive home. This was another short day, just 30 mostly flat miles from Bend to Sisters. We decided last night to have a lazy start. We knew the day would be short, and didn’t want to have to sit around before we could get into our hotel room again. I guess we had read the map wrong or something. Stage five of the Cascade Classic bike race was along our route for the first 10 miles or so. We were on the road while the amateurs were going at it. They just stopped traffic at intersections as needed. When the main peloton approached, a lead car came and yelled at us to get off the road Now. Well, there wasn’t anywhere to go except a gravel ditch, which would mean stopping on the road to dismount, so we went a bit further to where we could actually pull off and have some shade. Fifty bikes came by, which makes kind of an amazing whirring noise, followed by a few smaller pelotons. finally we got going again, but with a warning from a volunteer that we needed to be ready to get off the road with short notice. I was kind of annoyed. They didn’t actually have permission to close the road, and didn’t have any signs up. Plus, stopping a fully loaded bike takes planning to do safely. Evidently the people not actually racing were the only ones who cared, though. We got passed by other groups who offered friendly greetings. We got passed by a big peloton on a climb (where it’s even harder to stop safely, and can be really hard to get going again) and got thumbs up from some of the racers as they sped past us crawling up the hill. Fortunately, we turned off the race course before the pros started. 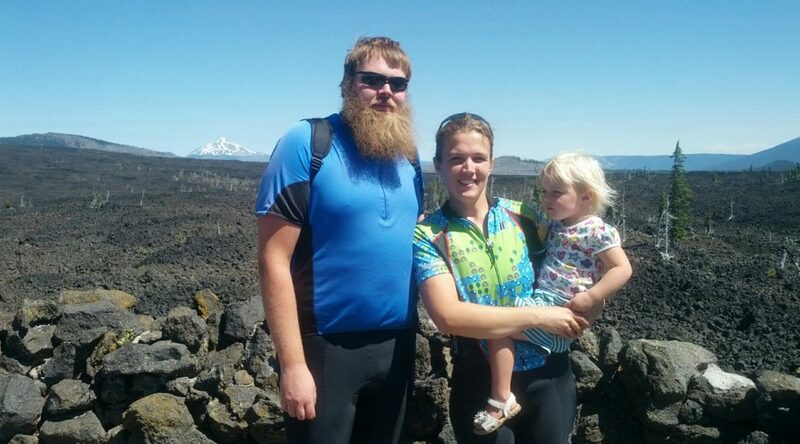 We spent some time on one of Oregon’s Scenic Bikeways, which was nice and had little traffic. We biked past lots of ranches with horses and cattle, and even a some sheep. There was lots of heavily irrigated grass, presumably for grazing. Once we crossed Highway 20, it got a lot more desert-like. There was little shade and it got a lot hotter. We stopped briefly at a vista point for lunch, but realized there was no shade, just a nice view of the Three Sisters and Broken Top. We ended up eating a little later, under a tree near somebody’s driveway. Then it was just a few miles into Sisters. It was a slight uphill, just enough to make you feel slow. Anne reports there was a headwind, too, which I guess she was kind enough to block for me. Sisters is a fairly small town (the sign said 2000ish), but with an oversized and vibrant downtown. There are lots of restaurants and kind of touristy stores, all highly walkable. We saw two deer today. One was crossing the street close enough to make me wonder if I would need to brake. The other was chilling off to the side of the road in some shade. I was jealous of the deer in the shade. The problem with these short days is that Ruth doesn’t have time to take a nap in the trailer in the afternoon. Then when we get to the hotel, it’s kind of new and exciting, so she doesn’t really nap there either. This makes her difficult to manage during dinner. When we do get her to bed around 7, us grownups aren’t really worn out since the ride was short, so instead of going to sleep soon after the kid, we have to stay quiet in the hotel room for a couple hours to avoid waking her up. Today was our shortest day yet, finishing up the Cascade Lakes Scenic Byway. 1500 feet up, then 3000 feet down into Bend. The rest day yesterday was nice. We rented a kayak in the morning (our arms didn’t need rest after all), splashed in the lake a bit, and took an afternoon nap. The morning today was a bit rough. We had a hard time figuring out exactly what flavor of applesauce Ruth needed Now (every now and then she likes to remind us that she is indeed a two year old). We ended up breaking out one of our remaining secret weapons — a phone loaded with kid’s music. while we were stopped, a female elk hopped across the road maybe 100 feet behind us. It was gone before Anne could turn around. I suggested that made us even for her deer sighting on the first day, but she reminded me that there were three for her, so she was still winning. The morning climb itself wasn’t too bad. 1500 feet split in two pieces, with less than half the climb above about 5%. Not much of a shoulder, but fortunately most of the traffic was in the other direction. Still no switchbacks. Even though it was still early, the sun was really hot. I went through all three of my water bottles before I knew it. We carry a 6L bladder for refills, though, so we weren’t in any danger of running out. We started seeing a lot more bikers, both mountain and road. We didn’t see any other touring folks, though. There was one mountain biker who had stopped to pick up a dead hawk. We usually just gawk at roadkill. Maybe he worked at one of the taxidermy places we passed. The seas of trees were still present, but today we got much more mountain poking up. 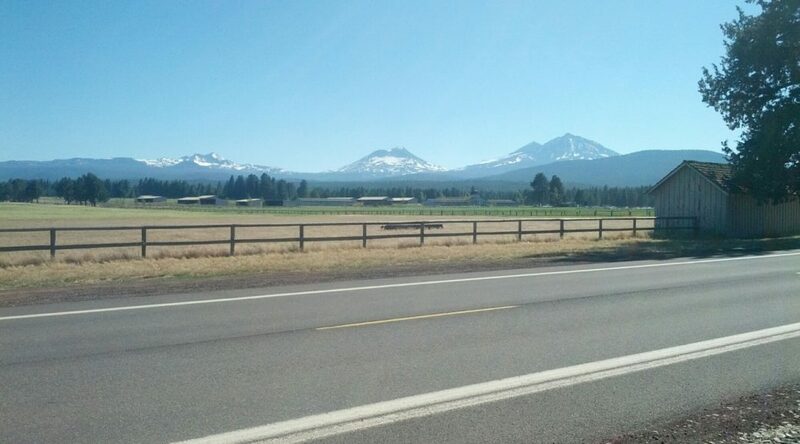 Mt Bachelor, Broken Top, and South Sister were all regular features in the landscape. The summit was our highest elevation for the trip, around 6300 feet. Sadly, there was no elevation sign to mark the occasion. Next, the descent. Very straight, very even. There was a very nice shoulder, too. Anne kept the trailer again, and seemed to be having fun. She said she didn’t need the brakes at all, and I only needed them to stay behind her. We stopped for lunch at a vista point, which luckily enough had a nice bench on a path behind the parking area. As we were leaving, there was a woman doing a traffic survey. My favorite question: “Are you planning to stop to recreate in the forest any more today?”. Anne said no, but I wanted to say that we had been “recreating” in one national forest or another all day every day for almost a week. I guess we didn’t end up doing again until we exited Deschutes National Forest, so I guess Anne’s answer was probably the accurate one. 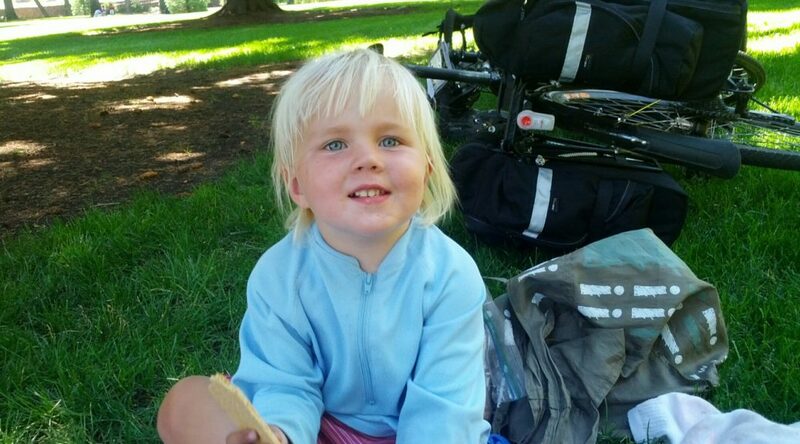 I hope she had a checkbox for bikers, since in the 30 minutes or so we were there, only bikers stopped by. As we got further into Bend, traffic picked up and the grade shallowed out. We had planned to take a the Long Haul Trail, which runs parallel to the main road, but it turned out to have big seams in the pavement and annoying road crossings, so back on the road we went. Anne’s bike computer shows a map of our planned path, but doesn’t actually know anything about streets. This works pretty well out in the county where there isn’t another turn for a mile, but can be hard to use in a city. I prepared a cue sheet, too, but it was too late, we got lost in Bend. Smartphones to the rescue. Then, when we got back on track, it turned out that the road we wanted to be on was closed. Finally, we made it to our hotel. It was to early to check in, so we hung out in the park next door. We probably looked like vagrants. I suppose we are. We figured out that the road closure was for stage 4 of the Cascade Classic bike race, and got to watch the Women’s Pros some after dinner. They were fast, although Anne pointed out that nobody had remembered to bring their toddler in a trailer. Stage 3 went past us on our rest day, and Stage 5 on our roads tomorrow. They’re going in the opposite direction, though, so I’m hoping it won’t interfere too badly.